Three years ago, as Mother’s Day was approaching, I decided it was high time my daughter and I started a new tradition in recognition of the day dedicated to mothers everywhere. No more would she need to worry herself about what tangible item or simple gesture might make an appropriate gift, I informed her. No shiny trinket, small kitchen appliance or fancy meal out would be necessary for me to feel appreciated. There's nothing better than waking up in the morning and driving to work inside a national park. Even in July and October, when the park's seams feel as of they might burst with visitors, working on behalf of the Smokies is the best job I've ever had. “Nah, there’s nothing to be scared of in there,” she told them. Her crooked, bone-thin finger pointed toward Daisy Town, the group’s ultimate destination. It was easy to see that her reflection in glass had once undoubtedly inspired poets. Flowing in gray waves down her ever-so-slightly twisted back, her hair evoked memories of raven’s wings. Her cheekbones stood as high as the Alps atop two identically sunken valleys cascading toward her strong jawline. The years had left marks; unflinchingly, she displayed them all. Friends of Great Smoky Mountains National Park and Great Smoky Mountains Association, two of the national park’s oldest and most productive partners, have shared space at the Sevierville Visitor Center on Winfield Dunn Parkway near Interstate 40 for more than a decade. GSMA has operated a retail space on the ground level, where it offers visitors educational items designed to enrich their Smoky Mountain experience, while FOTS staff occupied office space directly above. However, the organizations’ roles have transformed over time. One has outgrown its share of the space, while the other has felt the need to scale back, making the next move obvious. GSMA plans to close its retail store by Nov. 1 and Friends of the Smokies will convert the first floor into much-needed additional office space. 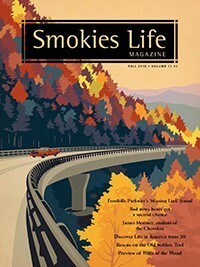 GATLINBURG, Tenn. — Great Smoky Mountains Association’s most recent issue of its award-winning Smokies Life magazine features an in-depth look at new groundbreaking bear research unique to Great Smoky Mountains National Park; the first four chapters of Willa of the Wood, a new best-selling fiction set in the Smokies; 10 compelling archival treasures stored at the Collections Preservation Center; and a comprehensive list of essential preparation techniques for staying safe while exploring the backcountry. GATLINBURG, Tenn. — Great Smoky Mountains Association’s Big Bend Killing: The Appalachian Ballad Tradition is nominated for two International Bluegrass Music Association Special Awards: Graphic Design by Karen Key and Liner Notes by Ted Olson. The International Bluegrass Music Awards honor members of the bluegrass industry who work behind the scenes. Winners of the Special Awards will be announced Thursday, Sept. 27. Awards are voted on by the professional membership of the International Bluegrass Music Association—the professional nonprofit association for the bluegrass music industry. Big Bend Killing: The Appalachian Ballad Tradition is a two-disc set produced by Great Smoky Mountains Association in support of Great Smoky Mountains National Park. It features 32 traditional folks ballads for a total of more than two hours of music. Featured performers include Doyle Lawson, Alice Gerrard, Laura Boosinger, David Holt, Rosanne Cash and many others. After traversing its lower section three times, I dreamed for the next three years of finally hiking the upper section of Balsam Mountain Trail. I finally got my chance this past July. If you’ve ever come face-to-face with a group of your heroes, then you understand one of the many emotions author David Brill experienced while hiking recently in Great Smoky Mountains National Park. As the author of Into the Mist: Tales of Death and Disaster, Mishaps and Misdeeds, Misfortune and Mayhem in Great Smoky Mountains National Park, Brill spent months researching how the national park’s search and rescue personnel respond to emergencies. Published by Great Smoky Mountains Association, Into the Mist has become one of the nonprofit’s most popular books of all time. What Brill himself experienced late last month could be told in Volume 2 of the Into the Mist series. 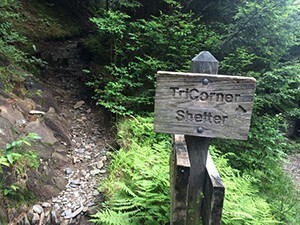 While researching an upcoming article on the park’s Old Settlers Trail for GSMA’s Smokies Life magazine, Brill and national park archivist Michael Aday found themselves hiking in a light rain when the unthinkable happened. 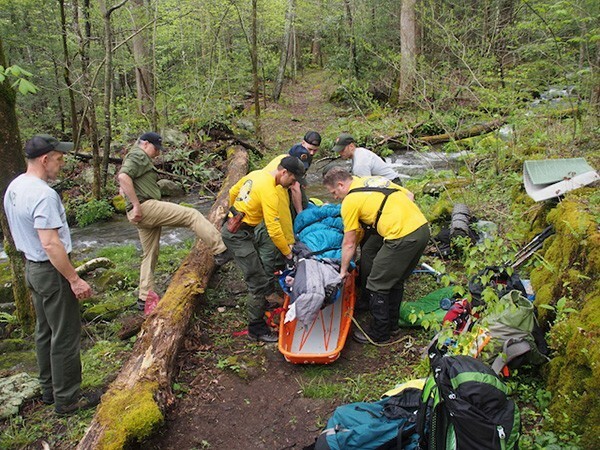 With just over a mile to go before reaching their campsite for the night, Aday slipped on a slick rock and suffered a compound fracture of his tibia at the last stream crossing of the day. 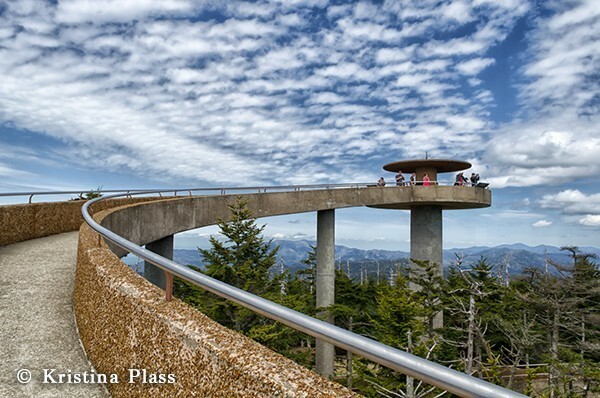 Great Smoky Mountains National Park officials have announced plans to open Clingmans Dome Road this weekend beginning Saturday, March 31.